I confess, I’ve described iOS games as looking beautiful before. I’ve said that iOS games look as good as console games. Let me go ahead and (gladly) put my foot in my mouth and welcome in a new standard for visuals in gaming apps from the folks at MADFINGER Games and their new universal third-person shooter app for iPhone and iPad, SHADOWGUN. In SHADOWGUN, you take command of John Glade, a bounty hunter in the year 2350 out to destroy Dr. Edgar Simon, a scientist with a mutant army at his disposal. 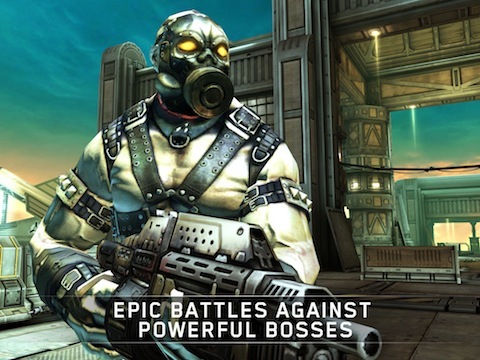 The plot is a classic “have-to-stop-the-evil-guys-from-taking-over-the-world” story, but the storyline is not the big seller of ShadowGun, it is definitely the state of the art graphics. Many iOS gamers (myself included) have looked forward to this game since Madfinger previewed it earlier this year at E3. ShadowGun bears a strong resemblance to the Gears of War franchise, which is one of the strongest compliments I can give a a third-person shooter. Madfinger has redefined what we should expect from a game on the iOS platform. 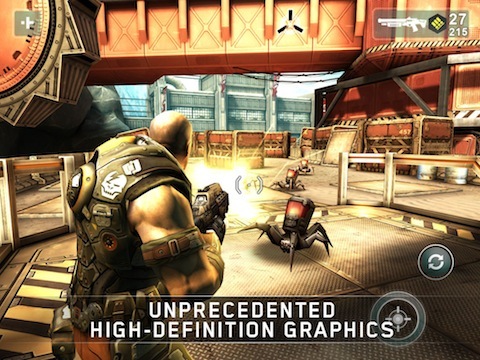 Truly, ShadowGun looks more like it belongs on a platform than a mobile device. Perhaps the most surprising part of the visuals are the fact that this is not an iPad only game, but a universal app, which means you can enjoy the game’s graphics wherever you go. But even the best visuals can’t stand up to poor gameplay, and Madfinger made sure the quality of ShadowGun’s gameplay matches the quality of the graphics. In fact, they packed over six hours of gameplay into the storyline that are really, really fun to play. One of my biggest gripes in iOS shooters that I’ve played has been the lackluster AI. Charging into the middle of six or seven enemies in most titles on the iPhone or iPad is usually an easy way to eliminate a group of enemies while taking very little damage. I’ve always assumed this would be the way iOS shooters would be, but not anymore. I played ShadowGun on normal difficulty (the middle of three levels) and experienced relatively merciless enemies. Being out in the open for longer than two or three seconds is almost a sure death sentence. Instead, you’ll need to hide behind barricades and around corners, and pick your spots to fire at the mutant armies. This tactical challenge is a pleasure for fans of shooters, and it’s fun to know that a little planning has to go into each level to succeed. ShadowGun isn’t without its faults; the lack of online multiplayer is disappointing, and I would have loved the inclusion of gyroscope controls for aiming and looking around, but even with the absence of these features, ShadowGun might very well be the best shooter available on iPhone and iPad. This game is a no brainer for any serious iOS gamer, and anyone that appreciates a genuinely visually stunning mobile game. 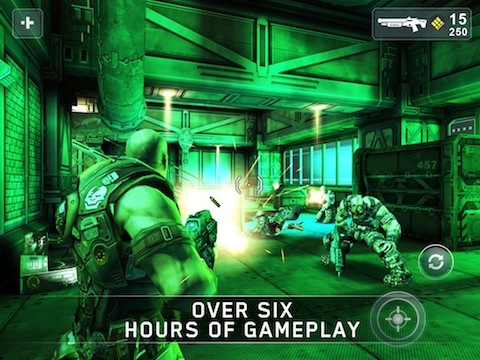 ShadowGun is a universal app available now in the App Store for $7.99. AppSafari review of SHADOWGUN was written by Alex Seiver on September 30th, 2011 and categorized under Action, Adventure, App Store, Featured, Fun, Games, Third Person Shooter. Page viewed 4417 times, 4 so far today. Need help on using these apps? Please read the Help Page.